The UK Elections came and we voted – or at least many of us did, though one of the big stories was that many people in many places came to vote an hour or more before the polling stations closed but were unable to get in to do so. Because the local recording officers had failed to make sufficient provision they were denied their right to vote, and almost certainly at least one Labour MP lost his seat as a result. Unfortunately, perhaps because things seldom go wrong, we have a system where it is prohibitively expensive to challenge the results. And of course, while usually I can turn on the radio the following morning and hear who will form the new government, this year it was different, with days of discussion and horse-trading. As virtually the only justification for our present system is that it delivers clear results, it perhaps is not surprising that it has now very much been called into question, and there are probably relatively few people who are not sitting MPs who support it. What has been more surprising are the demonstrations that have taken place in favour of electoral reform, and although I missed the first on the Saturday following election day as I had a prior engagement, I’ve covered a couple of these in Westminster since, and more are happening in cities around the country this weekend. The coalition has promised some kind of referendum on the matter, although it seems likely it will be on a very half-hearted change – and that even then many of the majority party will campaign for a vote against it. When the furore broke over MPs expenses, I was extremely dismissive. Frankly it seemed to me a lot of fuss over very little, and at least in some respects the fact that the body now set up to supervise the system will cost a great deal more than the relatively minor sums involved in the disputed claims in some respects confirms my attitude. But it wasn’t about money at all but about trust, and it was an issue that raised great forest fires among the public. I wonder if voting reform is another issue whose time has come and will resonate in a similar manner, so that eventually even the most dogged of politicians will have to bow. On the Monday evening following the elections, the Lib Dems were holding a meeting to discuss the coalition offers from both Conservative and Labour parties (though Labour didn’t really have anything to offer and certainly weren’t prepared to offer it, many of them relishing the idea of the Tories having to struggle with their legacy for the next session.) There was a noisy but peaceful protest outside the building where they were meeting and I went along to photograph it. Police had ensured that the protesters left a clear path through the crowd to the door of the building, and the media – including me – lined up for some time along its edge to photograph the people coming to the meeting. But for some reason most of them decided not to face the crowd and walk in this way, but to barge their way rudely through the protesters. The media were disappointed and the Lib Dems rather went down in my opinion. 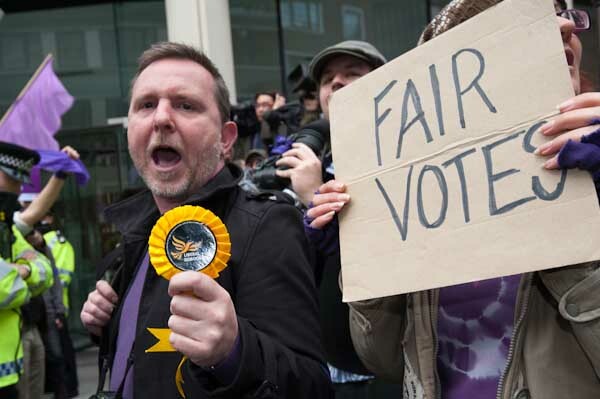 Among those protesting were quite a few members of the Lib Dems, some waving party membership cards, which was one obvious thing to photograph. Slightly more dramatically, one had a party rosette and had presumably stood as a candidate for the party and was holding that out. The ‘Take Back Parliament’ movement has also adopted the colour purple, a reference to a hundred years ago when the suffragettes wore purple sashes in their fight for votes for women, and supporters were urged to wear purple clothing, purple armbands and to have purple painted fingers; some too had purple face paint and there was a purple cow too at the protest. Another small link with the suffragettes was Tamsin Omond, one of the Climate Rush protesters who model their actions on those women who a hundred years earlier called for ‘Deeds Not Words’, and was more recently involved as an independent candidate for Parliament, attracting some support but unfortunately few votes. Given our system it is very hard for parties outside the major two and a half to persuade anyone there is any point in voting for them, even if voters support their ideas. 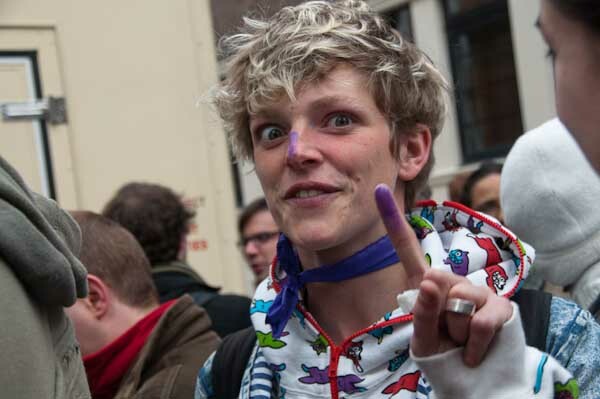 I’ve photographed her at quite a few of the protests that she had been involved in, and it seemed a good idea to take a picture of her with a purple finger. 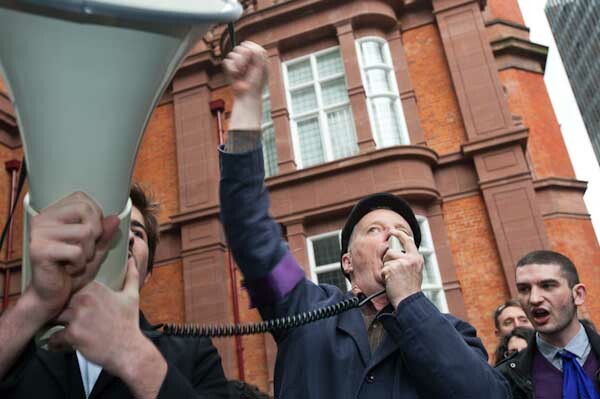 I’m not a great lover of celebrities, but Billy Bragg is someone who I admire, and who got himself stuck into this election, working against the BNP, and I was happy to take his picture too, speaking at this event. I’m not sure about the blur – the light was fading a bit by the time he spoke and perhaps I should have increased the ISO to get a higher shutter speed. 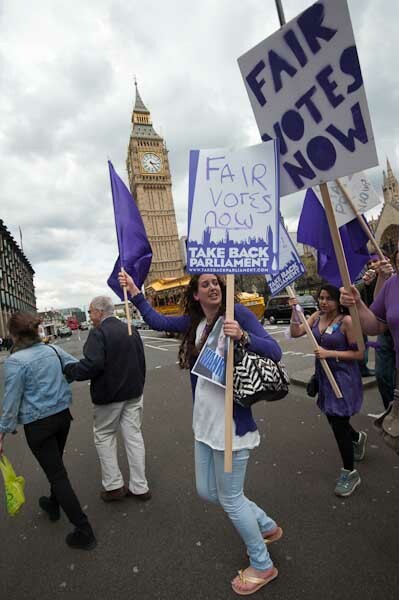 Of course there were the usual staples of demonstrations, placards and banners and people, and you can see these and other pictures from the event in Take Back Parliament – Fair Votes on My London Diary. I particularly like the de-luxe fur-covered camera bag held by her assistant standing behind her. 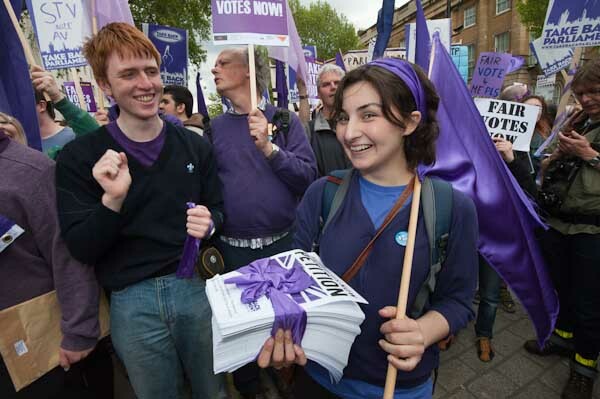 But perhaps the image I was happiest with, although I’m not quite sure why, was one of the petition that the protest was delivering to Downing St.
You can see more pictures from the day in Purple Protest Demands Fair Votes. This entry was posted on Monday, May 24th, 2010 at 07:03 pm and is filed under My Own Work, Photo Issues, Political Issues. You can follow any responses to this entry through the RSS 2.0 feed. You can leave a response, or trackback from your own site. Yes, I rather like Tamsin and of course have photographed her on numerous occasions – as you can see here and on My London Diary.